Danny and I LOVE food. We are what you might call foodies and we have absolutely found a love for Korean food. 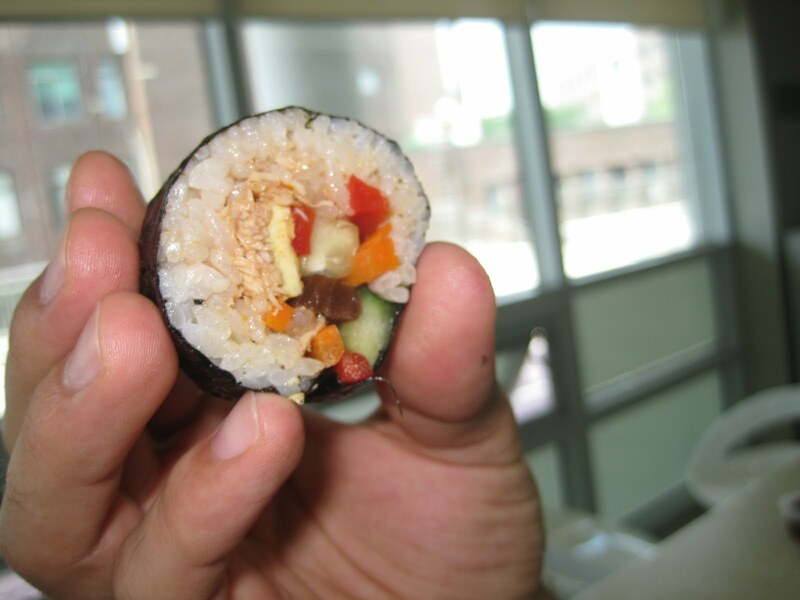 Some Korean food is an acquired taste, but once you find a love for it, you won't go back. - Dak Albi: a spicy chicken dish made with a lot of red pepper paste, garlic, cabbage, tteok (rice cake), and magic. This is easily our favorite, partially because of the rice that you can get at the end. You cook the chicken in a pan in front of you, and after you've enjoyed most of the dish, you leave some of the good flavor and sauce and then mix it with rice. After pan frying the rice again, you have the best part of the meal. This is a must have! - Jjimdak: another spicy chicken dish that has a wonderful garlic and soy based sauce. Andong, where we live , is famous for this dish and almost all Koreans know about Andong Jjimdak. They serve this chicken with clear "glass" noodles, potatoes, carrots, and lots of pepper. We suggest you eat it "tol mepgay", which means less spicy in Korean, because this is one dish that will make you want to chop your lips off because its so spicy. Mmmmm, mmmm, good! - Hae jang guk: "pork spine soup". This may sound strange, but it is one of the best soups you will have. Known as "hangover soup" it is hearty, warm and truly delicious. Mix in some rice and doenjang (soy bean paste) sauce and you will fall in love. - Dolsot Bibimbap: hot stone pot with mixed rice. You can get plain bibimbap but why would you when dolsot bibimbap exists?! The hot stone pot heats and crisps up the rice and makes it tastes fantastic. Bibimbap usually has a variety of veggies on top of it, topped with red pepper paste and an egg. Bibimbap is good but trust me that there is nothing like dolsot on a cold day in Korea! - Hoddeok: cinnamon pancakes. You can find this street food all over the place in the winter, and it is an awesome sweet treat. Why it is only a winter food, I don't know but try it and you will say "yum". Pajjang: green onion pancake. Sometimes called "Korean pizza", this is a great side dish that I really enjoy. It can sometimes seem overly greasy, but the trick is that you have to try it fresh. Bulgogi: marinated Korean beef. This is a Korean classic that most people know about. It is delicious and simple and you really can't go wrong with this one. Isaac Toast: Koreans don't really do sandwiches so this is as close as we can get. Basically Korean "Toast" places are simple sandwiches with a fried egg inside, but Danny and I have come to love them. There are pizza toasts, potato toasts, and all kinds of other delicious options that you gotta try. Also you can get great fresh fruit juices there as well. Whenever you are in the mood for a simple "comfort" food, toast is a great way to go. Kimbap: This is basically the Korean version of the California roll. This is a cheap and simple snack that Danny and I have had on many a bus ride, and we have even tried to spice them up with our own "waygookin" version. Simple, good, get some. Korean BBQ: cooking meat on a grill in the middle of the table is one of my favorite ways to eat Korean food. Since you cook the meat yourself, you really feel like you are a part of the process. This is also the food that made me fall in love with doenjang sauce. Doenjang sauce is one of those "acquired tastes" that I was talking about, but for me it is a MUST now with Korean food. Keeping trying it and I bet you'll love it too! - "Corn Things": we don't know what they are really called, but if you smell a wonderfully sweet smell in a subway stop, they are probably the "corn things". These are little sweet corn-shaped bread filled with chu cream or custard. Danny and I get them pretty much every time we are in Daegu. YUM. Bindaetteok: this is a food that Danny and I stumbled upon in Seoul, but one of our favorite junk foods. Bindaetteok is a mung bean pancake that usually has meat in it and it reminds me of the best tasting potatoe pancake you have ever had. This food is AWESOME with some Makkoli (rice wine) and late at night. 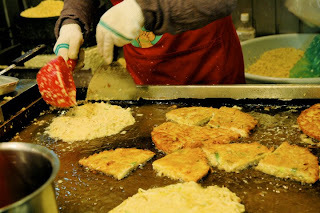 There is a market near Insadong that is famous for this dish, so ask around and you will see what we are talking about. Oh yeah.